One of Anthony Joshua’s uncle, Adedamola Joshua, has revealed that Anthony Joshua’s grandfather, Olaseni Joshua, used to be a boxer in his days once using his boxing skills to outwit three white men years ago. According to the uncle, “Anthony actually has boxing running in his blood because it is a family tradition. 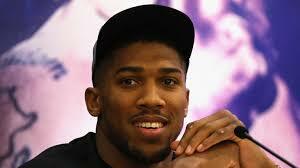 His grandfather Olaseni Joshua, after whom he was so named, was also a boxer. The uncle made this revelation while announcing plans to hold a celebration for the newly crowned boxing champion in Nigeria. The uncle, who lives in Sagamu, Ogun state, told the local Today news website that “The family as a whole is proud of Anthony’s achievements and we are very glad to be his relatives. We celebrated his victory and there are other plans for a bigger celebration. It is really exciting to have one of our own creating such history in the world. At that age to have 19 fights and not lost any with all of them ending in knockouts is commendable,” Adedamola, who is in his late fifties, said. Adedamola said Anthony’s father pays regular visits to the country and the family house, which is located on Akarigbo Road, Sagamu. He welcomed the idea of the state government’s plan to honour the boxer. He said, “As a close family, we hold regular meetings involving members both at home and abroad. Anthony’s father comes home regularly – up to six times a year. He was home for some days but left just four days to his son’s fight with Klitschko.